For other uses, see Three's a Crowd (disambiguation). Three's a Crowd (also known as Three's Company, Too in the Three's Company syndication package) is an American sitcom produced as a spin-off continuation of Three's Company that aired on ABC from September 25, 1984 (only one week after the final episode of Three's Company was broadcast) until April 9, 1985, with reruns airing until September 10, 1985. It is loosely based on the British sitcom Robin's Nest, which was itself a spin-off of Man About the House, on which Three's Company was based. Three's a Crowd continued from Three's Company where in its final episodes, Vicky Bradford (Mary Cadorette) is introduced as a love interest of Jack Tripper (John Ritter), beginning in "Cupid Works Overtime". In the following two-part episode, "Friends and Lovers", Jack asks Vicky to marry him but she refuses and explains that although she loves Jack, she does not want to be married because she remembers when her father and mother got divorced and she explains that marriage scares her. Jack and Vicky, however, eventually move to a new apartment together above his restaurant, the landlord of which is James Bradford (Robert Mandan), Vicky's wealthy father, who bought the building from Jack's former boss, Frank Angelino (Jordan Charney). James does not approve of Jack and he constantly tries to disrupt their relationship. Other characters included E.Z. Taylor (Alan Campbell), Jack's "surfer dude" assistant chef at his bistro and Claudia Bradford (Jessica Walter), Vicky's mother and James' ex-wife. Three's Company had been based on the sitcom Man About the House, which aired on ITV in the United Kingdom from 1973 to 1976. When the series concluded in 1976, series producers Brian Cooke and Johnnie Mortimer devised two spin-offs of the series. The first spin-off was fashioned for actors Brian Murphy and Yootha Joyce who played the popular George and Mildred Roper on the series. The series, called George and Mildred, ran from 1977 to 1980, and followed the Ropers selling their apartment building and moving into a high class neighborhood, the comedy arising from the seemingly lower-class Ropers and their relationship with their higher-class neighbors. The second spin-off was written for Richard O'Sullivan, who played Robin Tripp (which would serve as the basis for Jack Tripper on Three's Company) and was named Robin's Nest, also the name of his restaurant on the series. Running from 1977 to 1981, the series followed Robin moving with his girlfriend into an apartment above the restaurant he ran, a situation which was frowned upon by her father. Three's Company producers were anxious to capitalize on these spin-offs. In 1979, they had spun off Norman Fell and Audra Lindley into their own series The Ropers, based on George and Mildred, but it lasted only until 1980 after one and a half seasons. Three's Company's ratings remained high though. Executive producers Ted Bergmann and Don Taffner attempted to adapt the Robin's Nest series without John Ritter. A pilot for a series called Byrd's Nest was written, involving a young man living with his older girlfriend much to the chagrin of her father, who owned the building they lived in. The series was planned to be a spin-off from Three's Company and possibly a vehicle for Richard Kline, who played Larry Dallas on Three's Company, but ABC passed on the idea. As Three's Company entered its eighth season in 1983, however, ratings took a dive due to stiff competition from the new NBC series The A-Team. Realizing they had an aging show ABC okayed the development of a new series which was to be called Three's a Crowd. Development and casting of the new series occurred in secret as Three's Company's eighth season progressed. Fellow cast members Richard Kline, Joyce DeWitt, Priscilla Barnes and Don Knotts were kept out of the loop. During a Christmas hiatus in late 1983 producers auditioned several female leads to play Jack's new love interest Vicky Bradford, and eventually decided upon Broadway actress Mary Cadorette. An embarrassing situation arose when Joyce DeWitt accidentally walked in on the auditions after coming to the studio to set up her dressing room as the holiday hiatus was coming to a close. DeWitt was then informed by the producers that Three's Company would end at the close of the season and would spin-off into Three's a Crowd with Ritter as star. DeWitt, who had been with the show from the beginning and weathered the highly publicized contractual dispute between Suzanne Somers, ABC and series producers, was hurt by the secrecy involved with the series ending and the spin-off. DeWitt and Barnes found it difficult to tape the rest of the season, as both actresses learned that their characters would conclude with the series finale. Kline and Knotts, however, were offered an opportunity to have recurring roles on the spin-off; both actors declined the offer (Kline would make a guest appearance on the show in early 1985). Somers reportedly unsuccessfully lobbied to reprise her Three's Company character Chrissy Snow as Jack's love interest in the spin-off. The sense of betrayal that DeWitt felt towards Ritter was short-lived and they reconciled by Three's Company's end. In transitioning from Three's Company to Three's a Crowd, series producers decided to follow the plotline of the British series. Season eight of Three's Company drew to a close in a three-episode story arc. In the first of these episodes, Janet meets wealthy art collector Phillip Dawson. In the second episode, she falls in love with him, while Jack meets and falls in love with stewardess Vicky Bradford. Her wealthy father, played by Robert Mandan, does not approve of the relationship. When first aired, this episode ended with the words "To be continued... next fall", and when rerun late in the summer, this was changed to "To be continued... next week". The last episode of Three's Company aired as an hour-long special that kicked off the 1984–1985 fall television season and set up the premise for Three's a Crowd. In the episode, Janet married Phillip, and Terri relocated to Hawaii. Jack and Vicky profess their love for one another, but Vicky turns down Jack's proposal of marriage, citing her fear of the institution after seeing her parents feud for her whole life. They instead move in together, in an apartment above Jack's Bistro. In the last scene, Jack and Vicky are spending their first romantic evening together in the new apartment, only to have Mr. Bradford accidentally barge in on them, explaining that he received the key from Jack's old boss Mr. Angelino, having just bought the building from him, becoming the couple's new landlord. 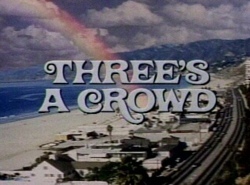 The title card for Three's Company then appears over the screen with the word "COMPANY" zooming out, being replaced with "A CROWD". Three's a Crowd employed most of the same writers, producers, and staff from Three's Company, but the new show's style was changed. While Jack was the lead star of Three's Company, it had an ensemble cast of three, with some ancillary characters. The new show, however, was centered around Jack. Vicky, her parents, and E.Z. played supporting roles. The new show also employed even more slapstick comedy for John Ritter to exhibit. The events and characters of the previous show were not mentioned, except in a late season episode in which Larry Dallas appeared. He had moved to Bakersfield due to business downturns, and during his visit invited along "Greedy" Gretchen, who had often been mentioned on Three's Company. When rebuked by Jack, saying he was now living with a woman, she replied, "You're slowing down, Jack—you used to live with two women." Three's a Crowd garnered only modest ratings, still competing with The A-Team. When the 1984–1985 television season finished, the show placed 38th in the Nielsen ratings. This put the show on the fence with ABC, since the show had enough of an audience to warrant renewal, however when compared to Three's Company's ratings and The A-Team, which finished sixth for the season, ABC was tepid in committing to another season of Three's a Crowd. John Ritter was told that ABC would commit to a half-season of thirteen episodes to see how the series would place, although Ritter was reported as saying that he would not return to the show unless a full season was ordered. Finally, ABC decided instead to pick up Diff'rent Strokes, which had just been canceled by NBC. Jack lies to his visiting aunt (Billie Bird) to try to cover up his living arrangement with Vicky. Jack hires surfer E.Z. Taylor (Alan Campbell) to be his assistant in the restaurant. Jack and Vicky argue over money. Mr. James Bradford (Robert Mandan) gives Jack an offer: if Jack marries Vicky, then James would give him money for his sprinklers at the bistro. E.Z. does not appear in the episode. In an attempt to get Vicky to accept his standing marriage proposal, Jack attempts to reunite Vicky's divorced parents. First appearance of Mrs. Claudia Bradford (Jessica Walter). James insists on caring for Vicky when she comes down with the measles, so he moves in. Jack also comes down with the measles. Jack seeks a psychologist's advice about his recent impotence. Vicky thinks Jack is cheating on her with E.Z. 's girlfriend Susie. Mrs. Bradford appears in the episode. Vicky and Jack try to spend time sharing each others' non-sexual interests. E.Z. does not appear in the episode. Jack is asked to identify a counterfeiter. The couple's weekend runs into problems on the airplane when Jack thinks the air marshal is a hijacker and James crashes their vacation in Acapulco. E.Z. does not appear in the episode. Vicky's old boyfriend Anthony Wilson opens a seafood restaurant across from Jack's Bistro and causes problems with Jack and Vicky's relationship until Vicky reassures Jack that she only wants him. James arranges a meeting between one of his business acquaintances, Carlo Fabrizi, and his ex-wife, Claudia Bradford, in the hope that Claudia will marry Carlo so that he will no longer have to pay her alimony. James falls in love with a young, beautiful artist named Lee Pelosi, against the better judgment of his daughter Vicky. Jack tries to save him from heartbreak when the situation plays out in a way James does not like. Vicky hides new golf clubs for her father in E.Z. 's van so Jack won't ruin her surprise. Meanwhile, E.Z. 's dog has become pregnant. Jack is under the impression that Vicky is expecting when he receives a phone call from a veterinarian about prenatal pills, thinking it's from Vicky's doctor. Mrs. Bradford appears in the episode. Vicky invites her friend Dorothy (Gail Edwards) over to cheer her up because she recently broke up with her boyfriend. Dorothy has new contact lenses that make her blink, which Jack mistakes for flirting. The situation confuses Jack even more when he overhears Dorothy on the phone telling a friend that she has met a new man. Mr. Bradford does not appear in the episode. Jack convinces Vicky to use a $1,900 refund check to invest in a case of 1975 vintage wine, thinking that it will bring a good return. It turns out to be a shipment of sour wine so Jack ends up having to take up a job in a sushi house to repay Vicky. Jack gives E.Z. lessons on how to impress his date, who is a high-society sorority girl. But the girl wants Jack more than she wants E.Z. Vicky keeps beating Jack at a trivia game, and other trivial matters, so Jack tries to best her in various areas. However, his attempts bomb, and he embarrasses himself at a beach carnival in front of guests. Jack tries to cheer up James because James is feeling old. After Jack and James get drunk, James is arrested for urinating in public and ends up in court. Jack's old friend, Larry Dallas (Richard Kline) from Three's Company, invites Jack to a swinging party he's throwing. When Vicky finds out about the party, she says that she doesn't mind, but really wishes he wouldn't go because his former love interest, "Greedy" Gretchen (Teresa Ganzel) will also be there. Gretchen puts the moves on Jack just as Vicky arrives. Mrs. Bradford appears in the episode. Jack saves James' life, and James suddenly finds Jack to be the son he never had. Mrs. Bradford appears in the episode. Jack's Bistro becomes the "in" place to eat in Santa Monica and Jack becomes a celebrity after a famous food critic gives his French fare a marvelous review. But Jack has forgotten his and Vicky's first anniversary and the cruise they were supposed to take. Mrs. Bradford appears in the episode. Jack goes to city hall to complain about the trash rate increase. When that doesn't work he goes on a radio show called Beach Talk to air his complaints and is stunned when James Bradford arrives to counter Jack's allegations as owner of Allied Waste Disposal. Jack has stardom go to his head when he appears as a passenger along with Vicky in a commercial for her airline (Trans Allied Airlines). However, turbulence occurs on the set when Jack and the temperamental director get into a fight. Mrs. Bradford appears in the episode. E.Z. does not appear in the episode. Daytime reruns aired on ABC from September 23, 1985 to January 3, 1986, followed by another prime time run on USA Network. Some syndicated versions aired under the title Three's Company, Too, using an instrumental version of the theme song of Three's Company. Six episodes of the series were aired on TV Land in September 2006, and four episodes were aired on WGN America in October 2008. The series began airing on digital broadcast network Antenna TV in June 2011 (as Three's a Crowd with its "Side by Side" theme song). ^ Pavan -- SitcomsOnline.com (2010-12-16). "Our Exclusive Interview with Antenna TV's Sean Compton; KTLA Preview of Antenna TV; 2011 SAG Nominations — SitcomsOnline.com News Blog". Blog.sitcomsonline.com. Retrieved 2012-10-24. O'Connor, John J. (September 17, 1984). "Ritter and a New Cast On 'Three's a Crowd'". The New York Times. Retrieved May 31, 2012. This page was last edited on 1 February 2019, at 19:05 (UTC).